Chili is pure comfort food and so easy to prepare. It’s delicious served over cooked barley, or spooned over a baked or microwaved sweet potato. 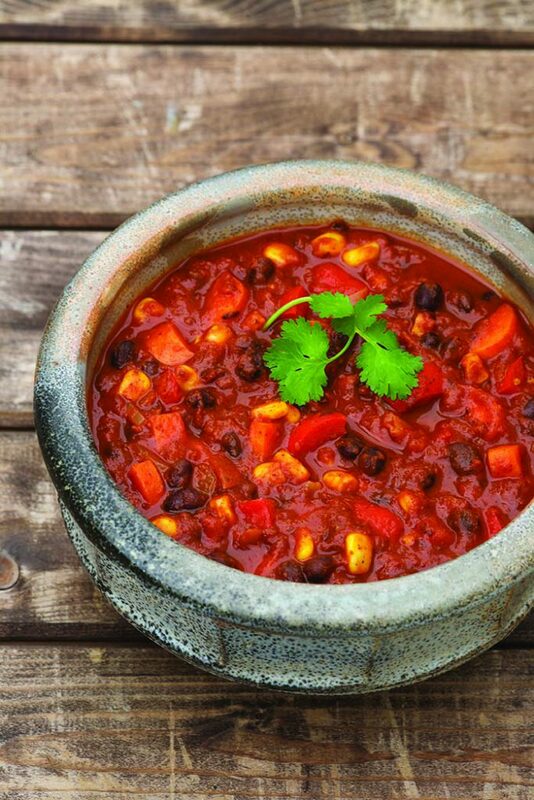 This easy to make chili recipe is vegetarian and its loaded with black beans and tons of flavour. Pulse Canada knows a thing or two about growing pulses. Their goal is to spread the news that dried beans, peas, chickpeas and lentils are healthy for your body and our planet. Every time you choose a pulse you’re giving your body a leg up in the health department and helping to reduce your carbon footprint. 1. Heat a large pot over medium heat; add oil, garlic, onion, red pepper and carrots; sauté for 10 minutes or until the onion is softened and slightly browned. Stir in chili powder, paprika, oregano and cumin; sauté for 1 minute or until fragrant. 2. Puree 1 cup (250 mL) of the beans in a food processor or mash well with a potato masher. Add the pureed and whole beans, tomatoes, corn, water and chipotle pepper to the pot, bring to a boil, cover, reduce heat to medium and simmer uncovered for 20 to 30 minutes or until the carrots are tender, stirring occasionally. 3. Serve with your choice of topping. Recipe created by: Teresa Makarewicz, PHEc for Homegrown Celebrating the Canadian foods we grow, raise and produce.